Goldens Heavy Body Acrylic Colors Water-Born: Golden's Heavy Body Acrylic Colors are known for their exceptionally smooth and thick consistency. 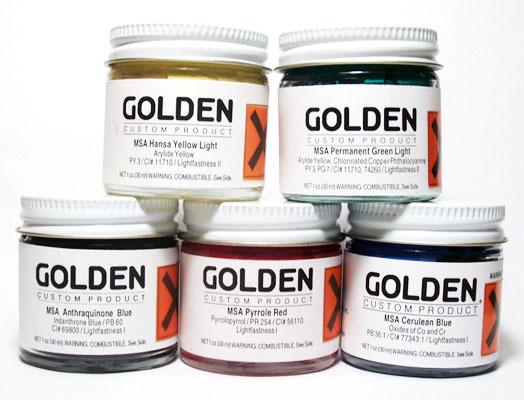 Goldens Mediums and Gels: GOLDEN'S ACRYLIC GLOSS MEDIUM is a general purpose, water-born, gloss medium that is useful for creating glazes, extending colors, enhancing gloss and translucency and increasing film integrity. 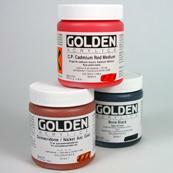 Goldens MSA Restoration Colors: Golden's Mineral Spirit Acrylic (MSA) Restoration Colors are produced from a mineral spirit-borne acrylic (n-butyl methacrylate) resin system.